The second edition of the Nation Cup for different age groups is the first championship organized in the region and includes categories for young riders aged 15–18 (CSIOY); junior riders aged 18–21 (CSIOJ); and children from ages 10–14 (CSIOCH). Male and female riders from 42 countries participated in the 19th Sharjah International Show Jumping Championship with an estimated 400 horses. The riders competed for 20 titles in the championship that took place over three days from Thursday morning to Saturday evening in the indoor and outdoor arenas at the Sharjah Equestrian and Racing Club. 39 riders participated in the first round of the Grand Prix competition which consisted of two rounds with 150 cm high jumps. Ten riders competed for first place in the second but only two of them finished the course without faults. Germany’s Philipp Weishaupt and his horse ‘Catokia 2’, completed the round in 34.60 seconds, breaking the record of best time and winning the Sharjah Grand Prix presented by Longines. In second place came Egypt’s Abdel Said and his horse ‘Arpege Du Ru’, who completed the second round in 40.32 seconds without any faults. In third, came KSA’s Abdullah Alsharbatly riding ‘Woulon L’ who completed the course in 52.75 seconds with two faults; the first of which was because he exceeded the allocated time in the first round and the second was for exceeding the allocated time in the second round. UAE riders dominated the lead on the second day of the 19th Sharjah International Show Jumping Championship in the second edition of the Nation Cup for different age groups, which included a young riders’ category (CSIOY); a junior riders’ category (CSIOJ); and a children’s category (CSIOCH). The idea of this cup came from the Sharjah Equestrian and Racing Club and was supported by the UAE Equestrian and Racing Federation (UAEERF) and was sponsored by Al Shira'aa Stables. Al Shira’aa Children Nation Cup (10-14 years old) included two rounds and 110 cm jumps. Three teams competed, and the UAE team consisting of Rashid Dherar Al Thani, Humaid Dherar Rashid Al Thani and Saif Abdulla Al Shamsi won the cup with only four faults, in second place came Jordan’s team with eight faults, followed by KSA’s team in third. Al Shira’aa Young Riders Nation Cup (15-18 years old) included two rounds with 130 cm jumps. Four teams from the UAE, Jordan, KSA and Egypt competed in the cup. 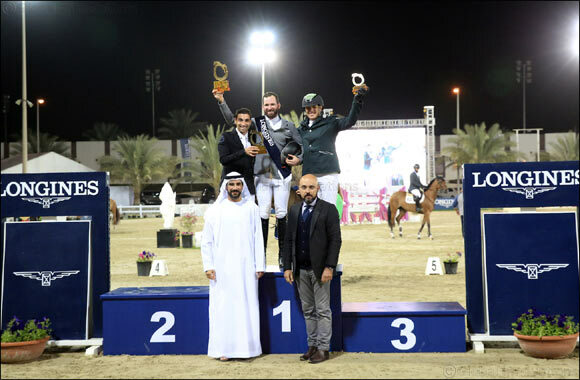 The UAE’s team won the cup with ten faults and a time advantage in the jump off, members of which were Moufi Owaida Al Karbi, Mohamed Omran Al Owais, Saeed Moh’d Al Maazmi and Ali Hamad Al Kirbi. In second place came Jordan’s team with ten faults losing their time advantage in the jump off, and in third came KSA’s team with 16 faults. Al Shira’aa Juniors Nation cup (18-21 years old) included two rounds of 120cm jumps. Six teams from the UAE, Egypt, Jordan, Syria, UK and Palestine competed in this category. The UAE Juniors’ team won the cup with eight faults, members of which were Omar Abdul Aziz Al Marzooqi, Mohamed Sultan Al Yahyai, Eisa Omran Al Owais and Mohamed Hamad Al Kirbi. In second place came Egypt’s team with 20 faults, followed by the teams of both Syria and Jordan in third with 24 faults each. The mini Grand Prix sponsored by Cavalor was a one round with jump off competiton and its course was designed with 145 cm jumps. 45 male and female riders competed in this category, nine of which completed the first round without faults and qualified for the jump off. KSA’s Al Duhami came in first place after he participated in this round with his horse ‘Cedan’ and completed the jump off in 35.25 seconds. In second place came Germany’s Jorg Naeve riding ‘HH Fleur’, who completed the round in 35.52 seconds with third place being taken by KSA’s Kamal Bahamdan riding ‘Sansibar 89’, who completed the jump off in 35.65 seconds. 14 male and female riders participated in the six bars cup, sponsored by Sharjah Islamic Bank, which has six jumps of 160 cm. Nine riders succeeded in the first round and qualified for the jump off in which jumps were set at a height of 180 cm; three out of nine riders completed the jump off and qualified for another jump off round, in which jumps were set at a height of 195 cm to determine the winner. Syria’s Ahmad Hamcho completed the course without faults riding ‘Lionell 19’ with Denmark’s Tina Lund and her horse ‘FreeStyle 39’ coming in second and Kuwait’s Talal Al Zahem with ‘Chivalry Double Dutch’ securing third place. The young Emirati rider, Ali Abdalla Bin Khadim, riding his horse ‘Doxanne B’ won first place in the Sharjah Chamber of Commerce Two Phases competition (CSI3*) in which jumps were set at a height of 130 cm. 65 male and female riders competed in the competition, 40 of which completed the first phase without faults. In the second phase, 13 riders completed the course without faults, led by Ali Khadim with 29.32 seconds, followed by Hamad Ali Al Kirbi riding ‘Foss’ with 29.98 seconds, and in third came Trevor Breen riding ‘Z7 Canya Dance’, who completed the course in 30.35 seconds. UAE’s Moufi Al Karbi won the Al Shira’aa Young Riders Jump Off, which included one round of 130 cm jumps. 21 male and female riders participated in young riders’ category, but only four of them completed the main round without faults. Three out of the four riders qualified for the jump off round and completed the course without faults. In first place came Moufi Al Karbi riding ‘Pogba’, who completed the jump off in 38.37 seconds, followed by KSA’s Mohamed Almalki riding ‘Galoutina C’, who completed the round in 37.83 seconds. In third came Egypt’s Mohamed Ashraf riding ‘Quattro 3’ and recording a time of 37.98 seconds. 30 male and female riders participated in the second CSIYH1* competition, sponsored by the Sharjah Equestrian & Racing club, which included one round and a jump off with 125 cm jumps for 7-years-old horses and 135 jumps for 6-year-old horses. Eight out of 30 riders completed the main round without faults, with four out of them completing the jump off without faults. In first place came Egypt’s Abdel Said riding ‘Nice Girl De Muze Z’, who completed the course in 38.84 seconds, followed by the UAE’s Abdullah Al Marri, riding ‘Carizma AM’ who completed the course in 39.38 seconds. Lebanon’s Naji Rachid riding ‘ Cesna M’, who recorded a time of 41.34 seconds came in third. The Al Shira’aa Children’s competition includes one round and a jump off with 110 cm jumps. 14 male and female riders participated in the competition, five of which competed in the jump off round. Only two riders completed the jump off round without faults, and the first three places all went to Jordanian riders - in the first place came Yousef Khair Al-Bakri riding ‘Amichora Z’, followed by Ali Yousef Ali with ‘Jupiler’ in second, and in third came Layan Amjad riding ‘Cassinger C’. 37 male and female riders participated in the Al Shira’aa Juniors Jump Off (CSIOJ) competition, which included one round with a jump off around a course designed with 120 cm jumps. 16 of the 37 riders qualified for the jump off after completing the first round without faults. In first place came UAE’s Sultan Majed Al Awani riding ‘Ajial’, who completed the jump off in 31.33 seconds, with the UAE’s Mohamed Hamad Al Kirbi coming in second with ‘Air Ukraine’, at 33.22 seconds, followed by Poland’s Amelia Mosocicka on ‘Cinnamon’ in third place with a time of 37.06 seconds.